I've sketched out two routes using the topo! software package. Its mileages are consistently too low, so these trips are really 50-plus miles. My preference is the southern one, although the northern route covers much of the same ground. The southern 'red route' is able to stay higher and off-trail a bit longer, and leaves Red Mt. Basin for a future trip, while the northern 'gold route' leaves less time for exploring Crown Basin as it arrives there later in the trip. Stay on trails from Rancheria trailhead east, north and east again over Chuck Pass (A) to the Crown Valley trail (~11 miles). 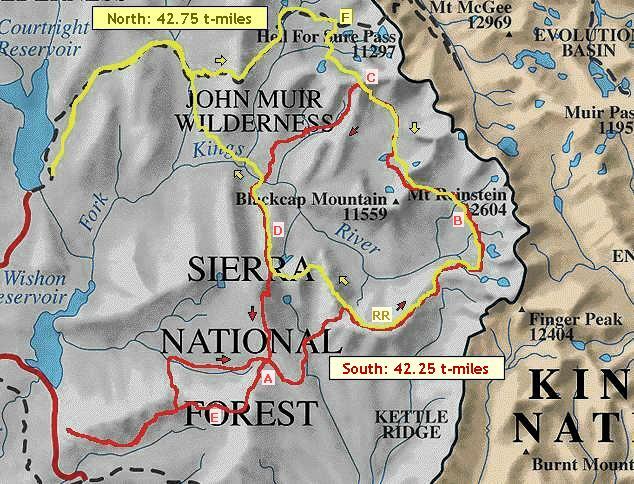 Travel to Scepter Lake, then head x-c east and up to near the crest of 'royal ridge' (RR). Contour to Crown Basin, then head north to Portal Lake. Climb higher and traverse the lake basin to Bighorn Lake (B). Explore this area for a day, perhaps climb Mt. Reinstein (12606', class-2 south slope). Contour or travel directly to Blackcap Pass, descend and turn NNW to Horsehead Lake. Travel upstream to Crabtree Lake, cross one of the 'two passes' (C), consider climbing class-1 Mt. Hutton, then head downstream to trail along Meadow Brook. Descend to the North Fork Kings, cross and ascend Nichols Canyon (D) to Crown Pass. Continue due south to point 10404 and descend to Chuck Pass (A). Continue south along crest, turn west to point 10000+ and descend to Duck Lake (E). Follow trail to car. Stay on trails from Maxson trailhead, heading generally east to Red Mt. Basin (F). Visit HFS Pass before turning south to Devils Punchbowl. Cross both of the 'two passes' (C) and contour to Bighorn Lake (B), then follow first route in reverse to above Scepter Lake (RR). Head west to Crown Pass, then descend Nichols Canyon (D) to the North Fork. Head north and west on trails to car. Here are the route profiles as created by topo! - the yellow line marks the 10000-foot contour, the vertical yellow line is the last mile spent at 10k. Of course, options abound on both routes. The south route could cross Kettle Ridge and return westward near Mt. Reinstein, or cross to Devils Punchbowl before turning south. The north route could cross HFS pass, descend to Goddard Canyon and also cross back by Reinstein. Both routes can be simplified by using nearby trails if the going gets too rough, and of course a base-camp setup could be employed in Blackcap Basin or Bench Valley. The red route is better able to accomodate a visit to the Finger Peak area, including upper Blue Canyon and Goddard Creek, but that would limit the time in upper Bench Canyon. By the same token, time in Red Mt. Basin on the gold route would limit views of Crown Basin on the southern end.